Looking for Granite Countertops Trinity FL? Read about a recent Granite Countertop installation that International Granite and Stone completed for the Rifkin Family in Trinity, FL. 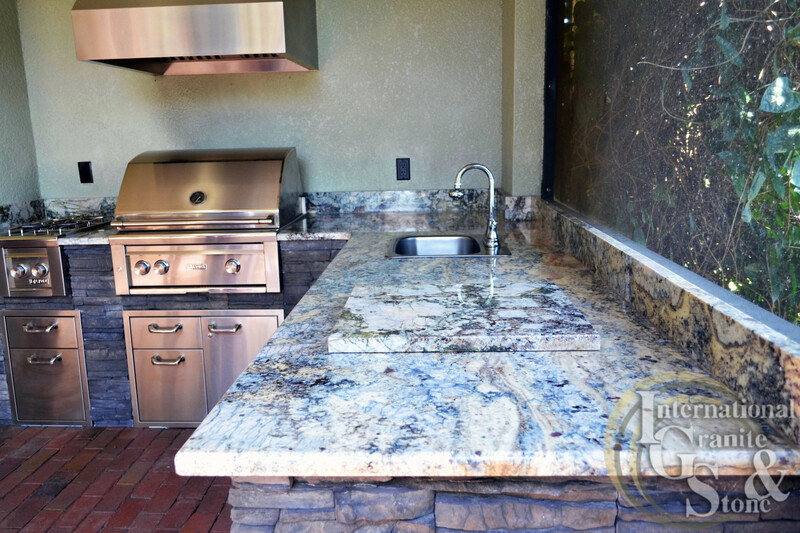 Outdoor Kitchens deserve some Granite love too! Adorn your Outdoor Kitchen with Granite Countertops that will last a lifetime and enhance your backyard space. When the Rifkin family bought their home 10 years ago, they had always dreamt of expanding their outdoor space. Mr. Rifkin wanted an outdoor kitchen, while Mrs. Rifkin wanted to beautify the pool area. After finally squaring away the pool area, it was time for Mr. Rifkin to focus on building his Outdoor Domain. With a passion to entertain and a beautiful screened in back porch, an Outdoor Kitchen was the perfect fit for the Rifkin home. Mr. and Mrs. Rifkin called International Granite and Stone for an In-Home Consultation and scheduled an appointment with IGS Design Specialist Elizabeth W. From there, the couple discussed their desire for a stone with blue in it for the Outdoor Kitchen, and Elizabeth was able to show them pictures of slabs we had in stock. Ultimately, Mrs. Rifkin made the final design choice and chose Azurite Blue Granite for the Outdoor Kitchen Countertops. “I wanted something that would play off the water from the pool, the blue tones in the stone are gorgeous.” Mrs. Rifkin said. Outdoor Kitchens work best with a Natural Stone Countertop like Granite, as opposed to Quartz. Quartz is not recommended for use in direct sunlight, as the resin that binds the material together may change color over time with UV exposure. With Quartz, Sunlight through a window is absolutely OK, as your window filters out the UV rays, but direct sunlight is a no-no. Outdoor Kitchens are generally much easier to install, given the more open atmosphere they are located in, and fewer doorways to travel through. Did you know that International Granite and Stone assesses your doorways and stairways before we start production on your job? We do this during the Template phase, to be able to accurately gauge how big of pieces our Installers will be able to fit through your doorways or stairwell. Our Sales Team and Template Team will take videos of the Countertop Space and surrounding areas to send back to our Production Team. With this Outdoor Kitchen, our team of Installers was able to carry it right into the Lanai area, straight from the truck. Installation took about half an hour. With an In-Home Appointment and Elizabeth W.’s Help, the Kelly’s Chose Azurite Blue Granite for their Outdoor Kitchen, for Its Durability and Style. Azurite Blue Is a Granite Stone color. The Granite is Quarried and Manufactured out Of Brazil. Blue Colored Countertops Are a Fan Favorite with our Customers. Granite does, however, need to be sealed, to block out stains, excess moisture, and damaging liquids. We recommend resealing your Granite Countertops once a year. Buy with Confidence, we have over 16 years of Fabricating and Installing Granite, Quartz, Marble, Soapstone, Onyx, and more in Kitchens and Bathrooms across the State of Florida. At International Granite and Stone-Tampa, We Make It Easy to Get Kitchen, Outdoor Kitchen, and Bathroom Countertops for your Home. Shop Online, Call us to Schedule a Free In-Home Appointment or Visit our Natural Stone Warehouse and Gallery in Tampa, Featuring: Granite Slabs, Cambria Quartz Slabs, Quartzite Slabs, Kitchen and Bathroom Displays, Samples and More. At International Granite and Stone, Customer Satisfaction is our top priority. We’ve worked tirelessly for over 16 years to establish a loyal client base in the Tampa Bay Area.